Not sure if this part will fit your appliance? Please email us with your model and we can verify compatibility. YOU ARE RESPONSIBLE FOR ENSURING THIS IS THE EXACT PART NUMBER YOU NEED BEFORE YOU PURCHASE IT! 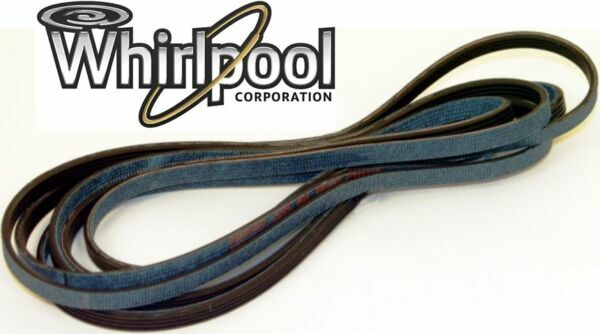 This is a GENUINE "Whirlpool Corporation Factory Certified Parts" belt. WCFCP is also known as FSP. Why pay more for an aftermarket when you can buy an OEM factory part for less!? This belt measures 92-1/4 inches long, 1/4 inch wide and is a 4 rib, 3 groove belt. It fits the majority of Whirlpool-built dryers which includes most Whirlpool, Kenmore, Sears, Estate, Roper, Admiral, KitchenAid as well as some Maytag and Crosley. However, if you are not 100% sure this is the correct belt for your dryer, PLEASE contact us so we can verify it for you! This ships direct from us to you, for FREE! Buy here and save money! We strive to have the LOWEST online price to save you the MOST money! We give discounts on multiple items purchased, email for a quote. Feel free to email us with any questions you may have. Thanks a lot for looking and have a great day! FIND A LOWER PRICE ONLINE FOR THE SAME ITEM IN THE SAME CONDITION? LET US KNOW AND WE WILL TRY TO BEAT IT!!! Mist Frigidaire EPTWFU01 Pure Source Ultra II Refrigerator Water Filter Replac..